The unseen Ghost Host acts as a sort of ambassador, a go-between, someone equally able to speak to us in the mortal realm as well as to his fellow spirits (presumably). Other than a few directives from the Cast Member Butlers and Maids, telling us to get to the center of the stretching gallery, the GH is our only narrator and guide. He never really tells us what his motivation is in taking us on this little tour. Right up until the end of the ride, you don't know if he's good or evil. We're so used to this arrangement by now that we forget that doing it this way was a choice. 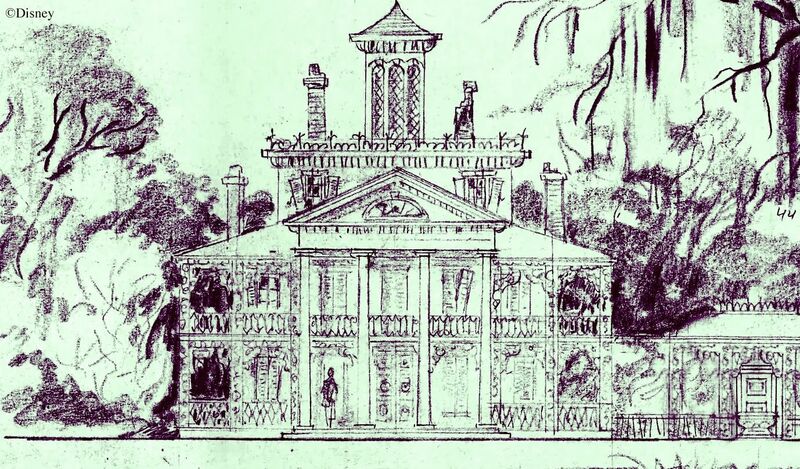 As it turns out, it was a choice made only a few months before the Haunted Mansion opened. Some of the rejected alternatives would have made for a very different ride experience if they had been implemented. One of these is fairly well known and has left traces behind in the ride. There is another one, far less well-known, which has left nothing behind. One thing they have in common is that both of them add an additional character who interacts with both the Ghost Host and with you, the rider. Very different chemistry. This was not a trivial decision, as we'll see. Died in the wool Mansionites know a lot about this character, so if you're one of those, and you're impatient, you might scroll down to the Cat section, which includes stuff you've never seen, I promise. Riders can hardly help noticing that there is a raven which accompanies them throughout the ride, starting with the Conservatory scene and ending at the entrance to the crypt at the end of the graveyard scene. There are five all together, but they are all supposed to be the same character. All it does is caw at us. Especially at DL, particular attention is drawn to it as we descend into the graveyard. Despite having our focus obviously directed at it at that point, we're gettin' bird noises and that's it. 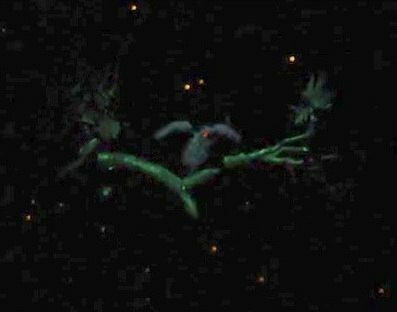 Originally, the WDW raven sat on the branch right above you too, as you tilted back, but due to "guest abuse" it was moved back and put on a branch well off to the side. Ketchup packets, I imagine. Caw-caw. At least the bird sounds real. According to Stacia Martin (The Sounds of Disneyland [Disney, 2005] 31), he was voiced by "Candy" Candido, best known as the go-to guy for basso profundo in cases where even Thurl Ravenscroft couldn't get low enough. (Candy must have had freakin' bridge cables for vocal cords.) What is less well-known is that Candy was extraordinarily versatile and could do very high voices as well. 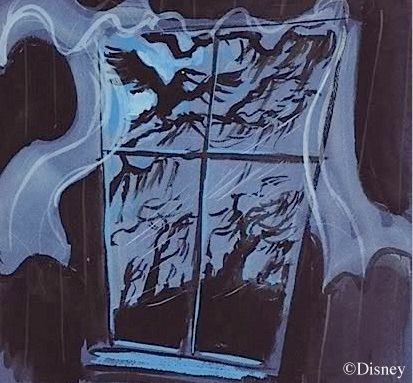 The same source says that Candy did the raven in Sleeping Beauty and simply hauled out his raven cry again ten years later for the Mansion. 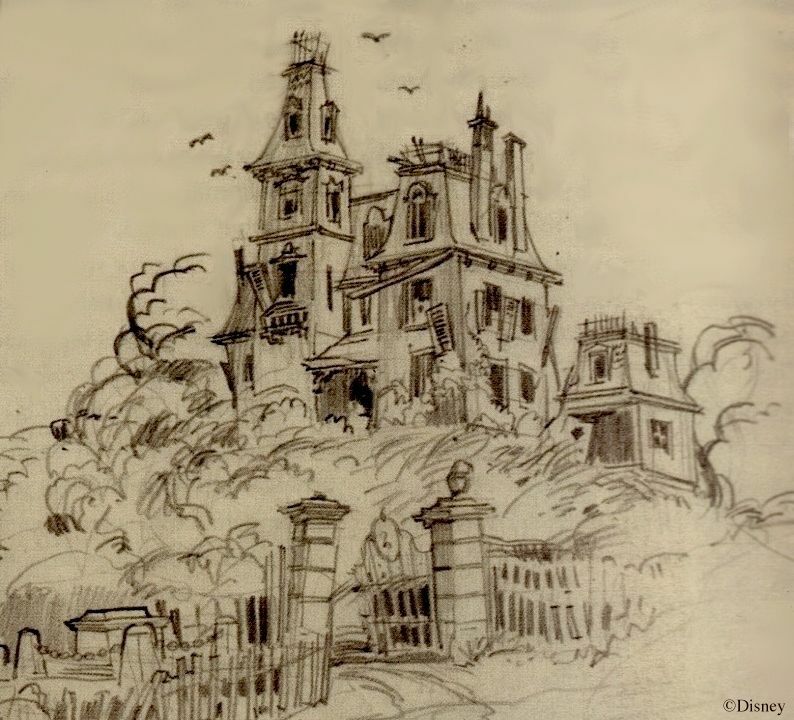 The eerie raven first appears in a Ken Anderson concept sketch. 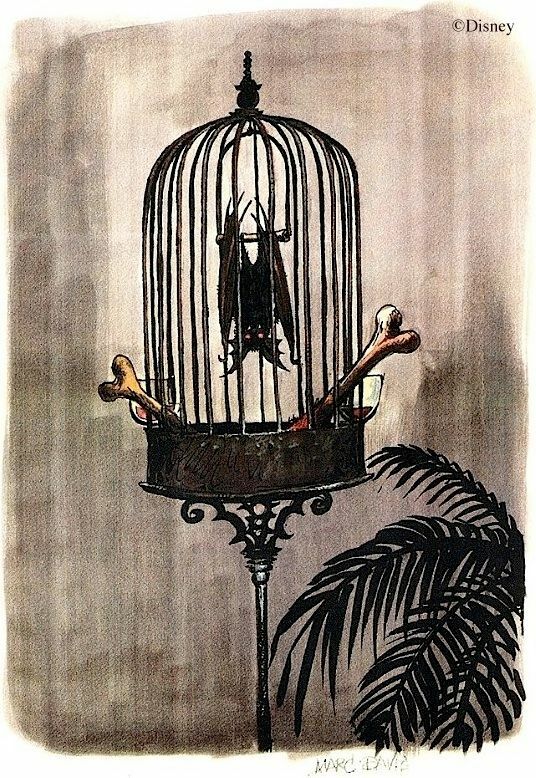 Marc Davis liked it and kept it, and it seems that there was never a time when it wasn't going to be part of the show. Is the talking raven taken from the famous Edgar Allan Poe poem? If we're speaking of an indirect influence, the answer is an easy yes. Poe is indeed responsible for adding the raven to the short list of recognized Halloween critters (bats, spiders, black cats, owls). But even in a direct sense, the answer is yes. In an early script, the raven warns us about itself (huh?) and the hitchhikers, with "nevermore's" and "evermore's" sprinkled everywhere. The lines were recorded at one point by the incomparable Eleanor Audley (Lady Tremaine, Maleficent, Madame Leota). Warning! If you're an admirer of Ms. Audley's work (yes, yes, I see those hands), this excerpt is painful to listen to. But we historians cannot afford the luxury of pity. Oh geesh, that was bad. Anyway, it proves that X. Atencio was directly influenced by "The Raven" when he tried to script the character. One problem with the raven—besides being annoying—was that it was too small to command your attention in some of the larger scenes. Maybe a bigger animal would work. Let's see...no, you can't have an elephant in a haunted house. How about a black cat? More specifically, how about an Edgar Allan Poe-inspired black cat? 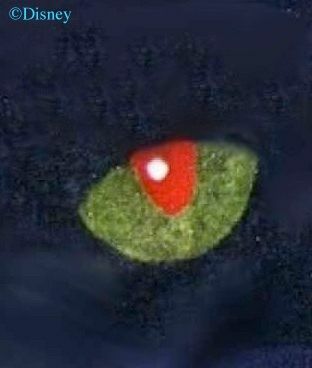 The narrator had a beloved black cat for a pet, but one day in a fit of alcoholic rage he gouges out its eye with a knife. Later on, guilt at the sight of the one-eyed black cat turns to resentment and he kills the animal. Later he finds (or is found by) another one-eyed black cat and takes it as a pet. In yet another one of his fits of rage he murders his wife and walls her up in the cellar. 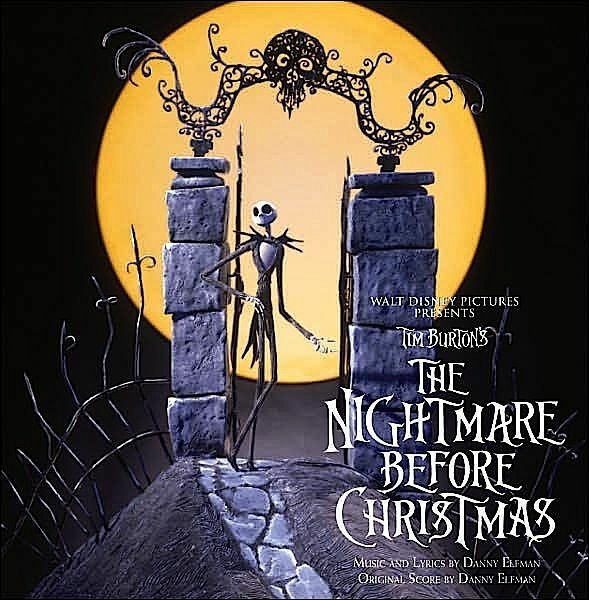 When the police investigate, however, the narrator is betrayed by the howling of the cat inside the wall, where it had been walled up with the corpse. A much creepier Poe animal than the raven, certainly. Most Mansion fans know about the existence of the one-eyed black cat only from a couple of Paul Frees outtakes, in which he tries out his note-perfect Bela Legosi and Peter Lorre voices while using a revised HM script. Dude, when Count Dracula sees fit to warn you about a kitty, it must be one bad motorscooter. 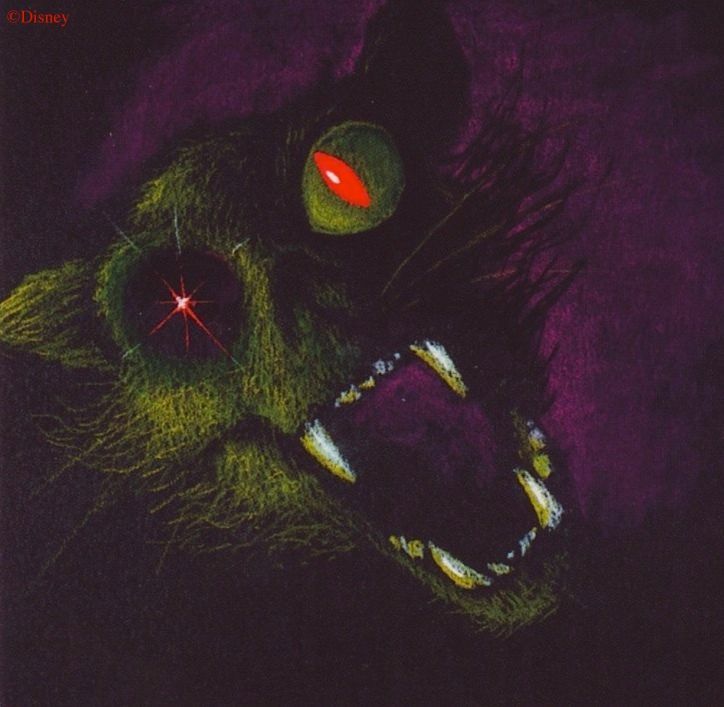 Apparently, the eye would morph into a shiny point of laser-like light, and a cat face would appear with only one eye. The first eye you saw turns out to be the missing one. From the looks of it, this loud and angry feline is looking for more than just a Little Friskies num-num. The morphing continues, and the face rots into a more human form. Not surprisingly, this does nothing to improve its mood. Good Lord. And how was this thing going to be presented? A projection? That isn't clear. It's possible that the "cat" was going to just pop out unexpectedly along the way in its various stages of demonic materialization. The face above looks a lot like a blast-up head in another X concept sketch. A quick look at some actual blast-up heads (inset) confirms that this is what the artwork is about. So maybe our creepy "cat" was going to jump out and surprise us here and there throughout the ride. Good Lord. When neither the demonic one-eyed black cat nor the "nevermore"-squawking raven ended up being used, the HM lost its only clear Edgar Allan Poe allusions (although you could make a case for a Tell-Tale Heart allusion in the bride's beating heart). 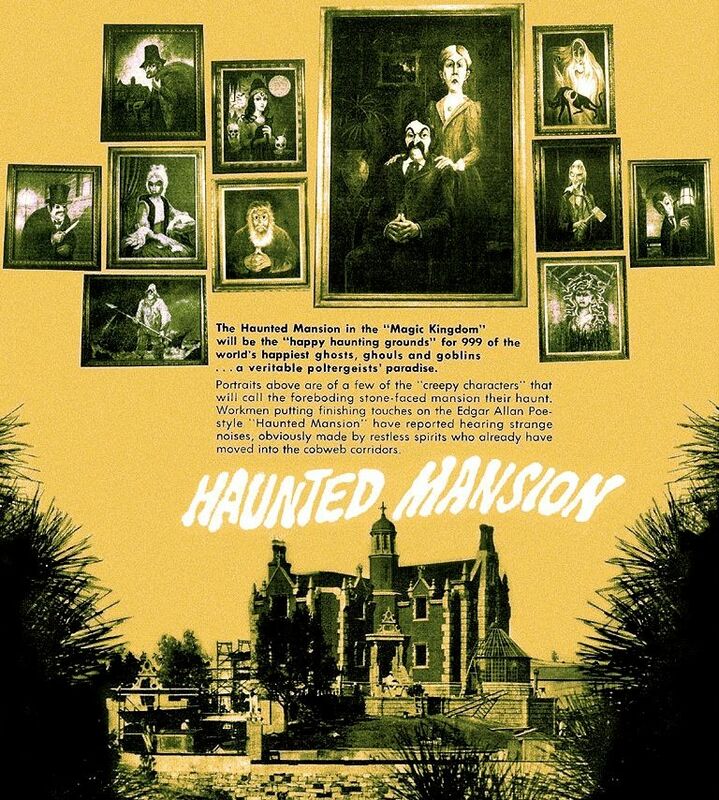 It would have been nice if someone had told the composer of this WDW pre-opening publicity poster that the Haunted Mansion could no longer be accurately described as "Edgar Allan Poe-styled." The black cat was a short-lived idea, with good reason. By having the Ghost Host warn you about a clearly malicious and dangerous creature like this one, he cast himself into the role of protector. He was there to help you. Similarly, in the 1968 script, the GH graciously informs you at the outset that you will not be harmed. That's very decent of him. Too decent. Who wants Santa Claus for a Ghost Host? 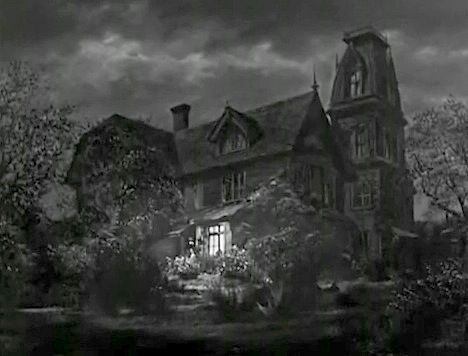 A haunted house is an allegory of life itself. You enter here and you exit there, and in between is a dark twisted corridor filled with frightening sights. You may get advice along the way, but you never have quite enough evidence to be sure that those voices have your best interest at heart. Do you really want to go into that haunted house that the neighbor kid put up in his garage for Halloween—the one who's a minor league juvenile delinquent the rest of the year? 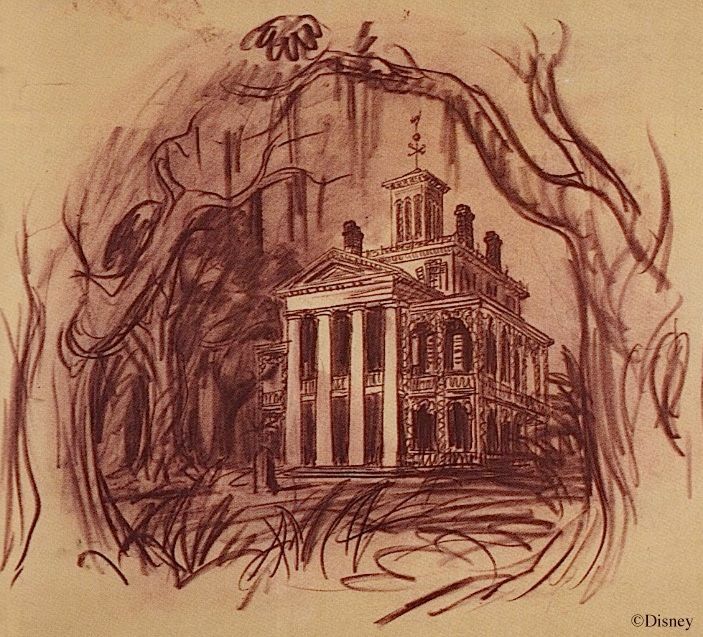 The Haunted Mansion is no different than any thirteen-year-old's spook house, and it's no different from life. Once you're in, you don't know if the Host is benign or malicious, so you have no choice but to go ahead, even with insufficient data. When you're stuck in a haunted house, the secret is to not panic and to keep your wits about you and to just keep going. If you do that, you're likely to make it. So the trouble with the villainous black cat is that it made the Ghost Host much too unambiguously a good guy. It's important that he make you a little nervous, a little unsure. What was the trouble with the raven, then, aside from being a tad too small? With the cat, we had a bad guy co-narrator and a good guy main narrator. With the talking raven, we had a morally ambiguous co-narrator along with a morally ambiguous Ghost Host. At first, you don't really know if either of them can be trusted. But in that case, why do you need two narrators? The real problem with the raven was that it was redundant. Turn off its dialogue and give its few substantive comments to the GH, and ta da, nothing is changed. Just make sure the GH never really tells you what he's up to. New artwork added Nov 1, 2012. Major additions were added (as additions are wont to do) Jan 28 and June 2, 2014, in pink. Yet a further addition arrived in May 2017, in red. 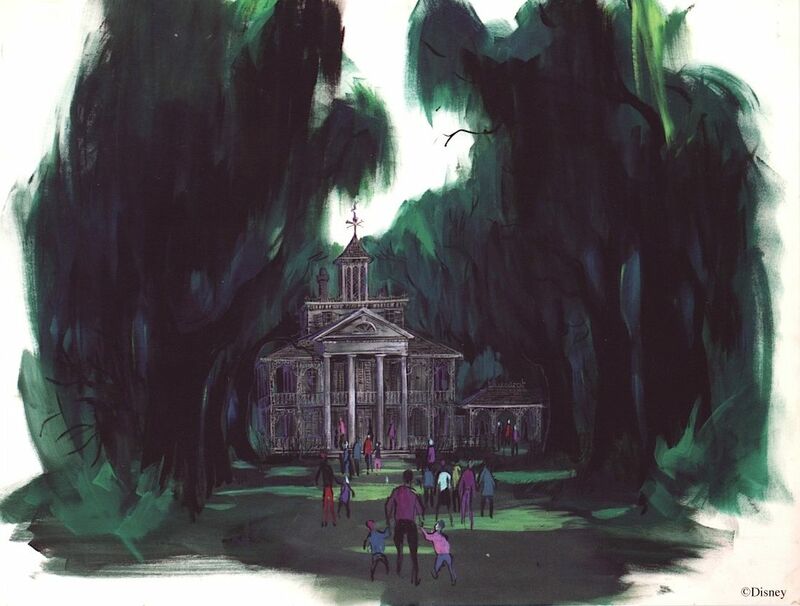 Who doesn't want to draw a haunted house, especially if you're a good artist and you can? 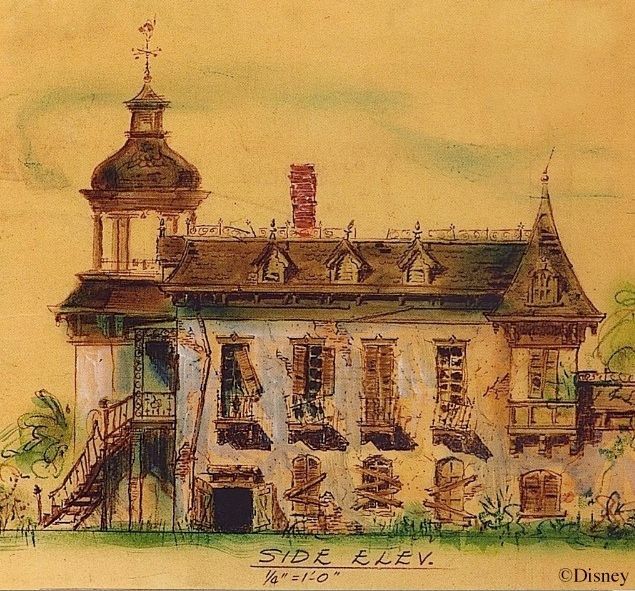 Perhaps half a dozen different artists took a whack at conceptualizing the Disneyland haunted house between 1951 and 1961. That may or may not be a record, but it's really not surprising. 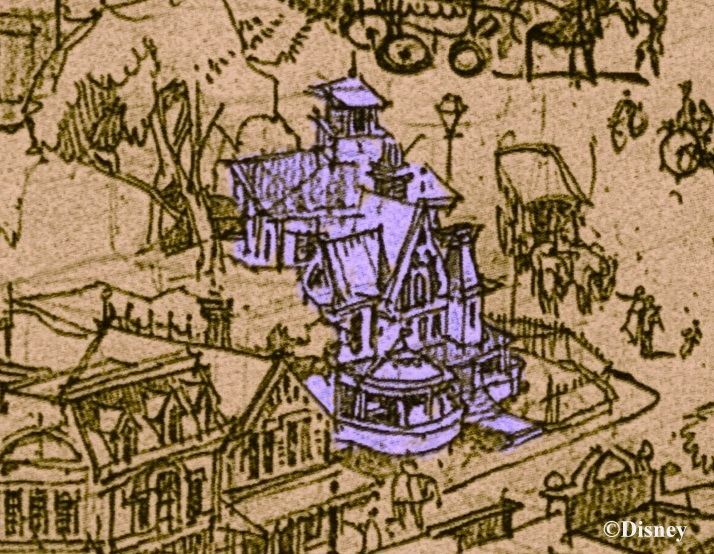 As many of you know, even in his earliest ruminations Walt wanted to include a haunted house in any future amusement park he might produce. This was back when "Disneyland" as we know it was not so much as a twinkle in his eye. Some of these images are well known, some less so, and some not well known at all. I thought it would be a nifty idea to gather all of them together into a single location, which I don't think anyone has done before. 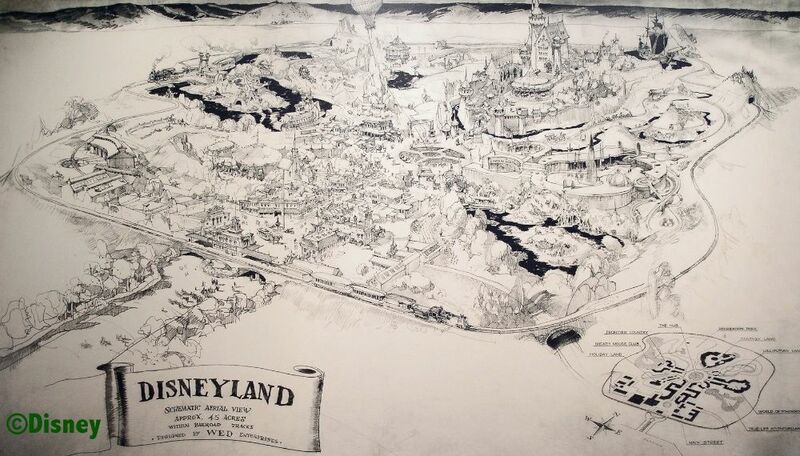 It all starts with Harper Goff's 1951 sketch. I'd classify this one as "pretty well known." There's no attempt here to figure out how the thing would actually work as an attraction. This is just concept work. of-the-street" kind of thing. 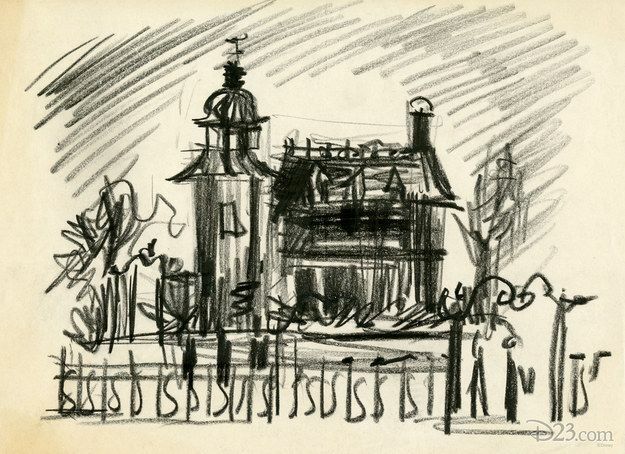 This 1953 sketch by Dale Henessy is not as well known as Goff's. 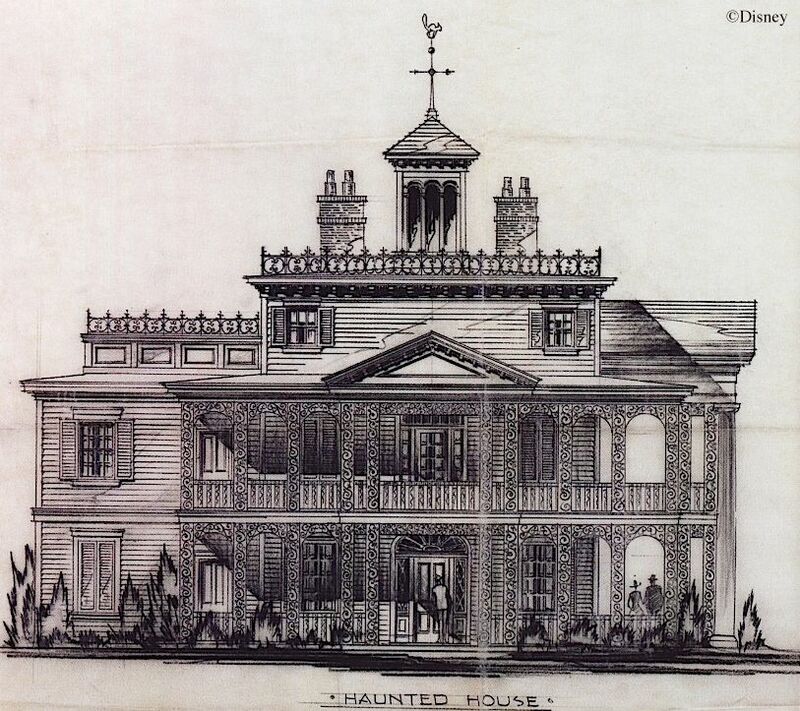 indeed represent a haunted house, since Henessey evidently interpreted it that way. And...here's something new as of May 2017. 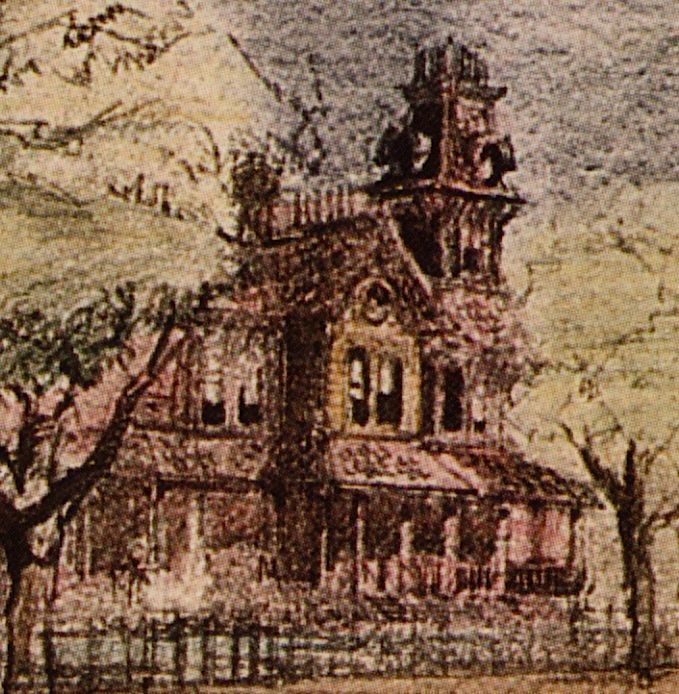 This is from a copy of the above sketch that Herb Ryman himself supposedly reworked further by tinting it and thickening some lines, in order to achieve greater clarity and emphasis. It sold at auction in 2017 for more than $700,000. 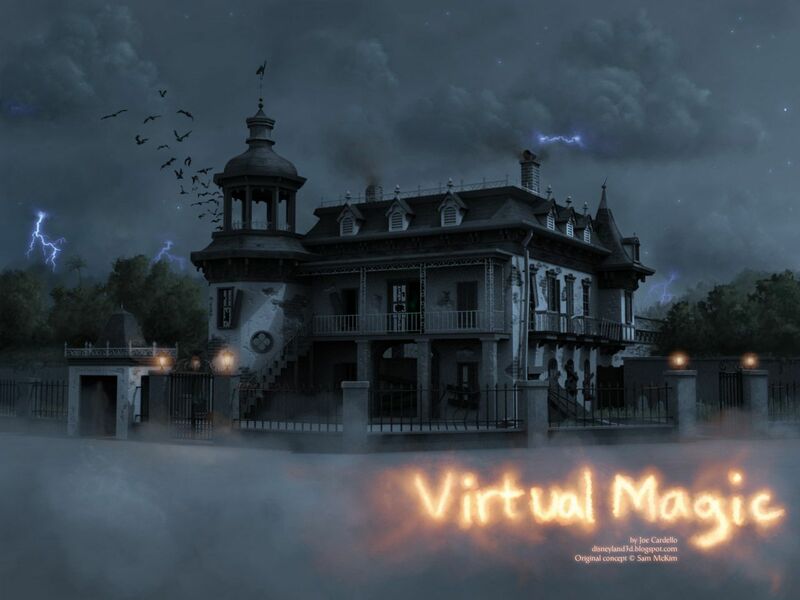 Here's the Haunted House part (courtesy of Jeff Baham). The first artist to come up with a design with serious legs (although that sounds like something Rolly Crump would do) was Sam McKim, about 1957. 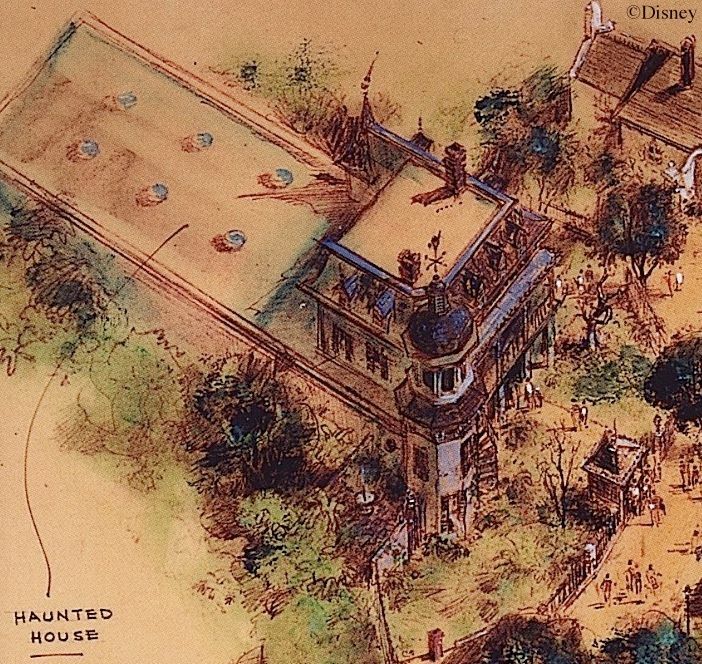 Not only did he sketch a haunted house, he did preliminary architectural design on it as an attraction, and he was confident enough about it to put it on one of his classic, cartoon-y, souvenir park maps, as if it was a done deal. We're not on Main Street any more. 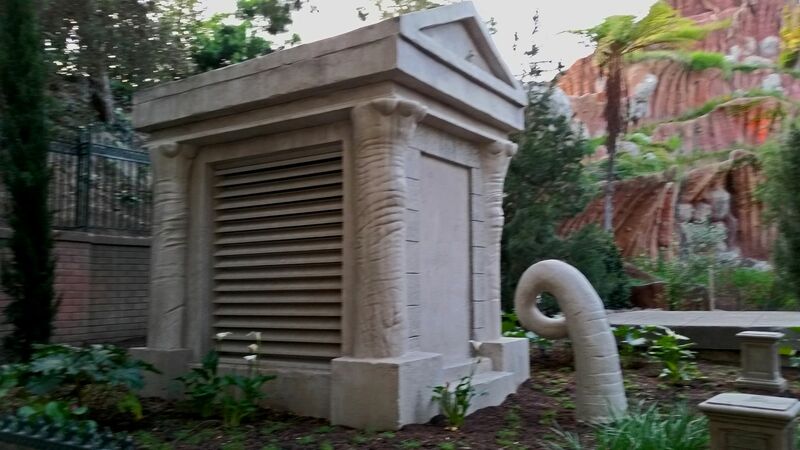 This one is in the back corner of the proposed New Orleans Square, almost in Adventureland. In fact, it's right about where the Indy Jones ride is today. Joe "Datameister" Cardello, a future Disney Imagineer, has taken a special interest in this disused Sam McKim design and produced a highly-ambitious and very impressive three-dimensional computer-graphic recreation. You can see the whole set of images HERE. 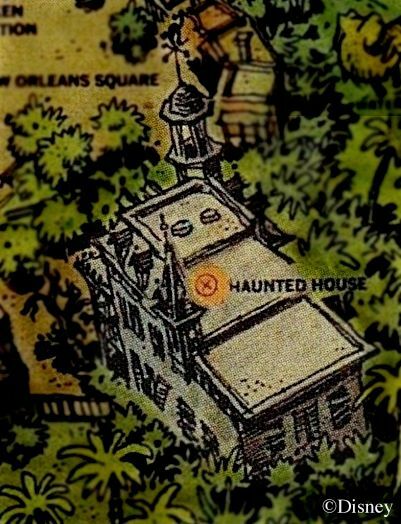 That takes us to 1957, but in 1957 Ken Anderson was given the haunted house assignment, and the next chapter is very well known indeed. 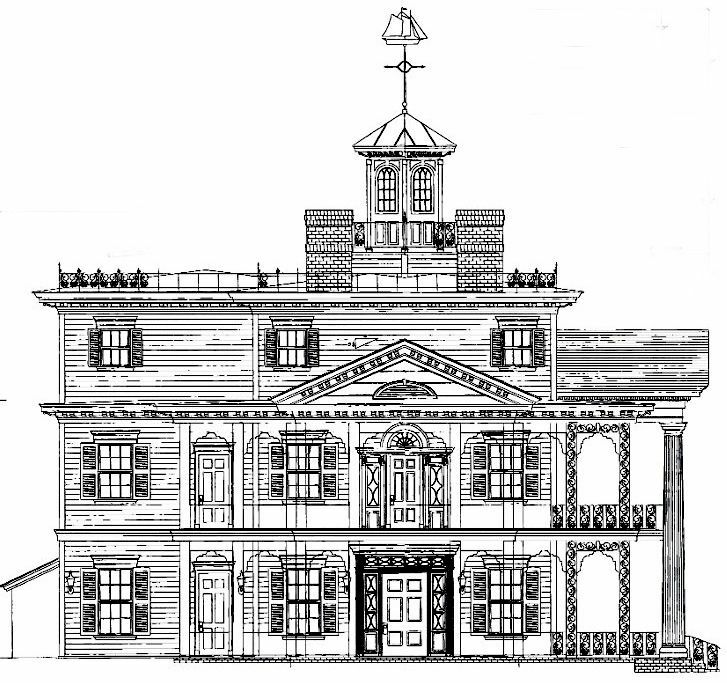 Ken did a sketch based closely on the Shipley-Leydecker house in Baltimore, and it proved to be the defining look of the building to come. 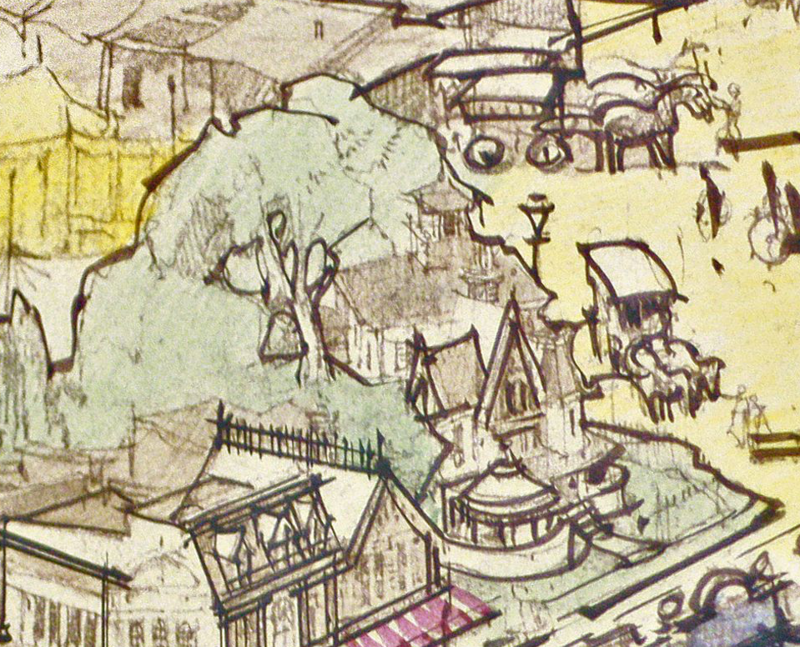 Two or three artists used Ken's sketch as a springboard for further work, narrowing down the architectural details and conceptualizing the landscape setting. 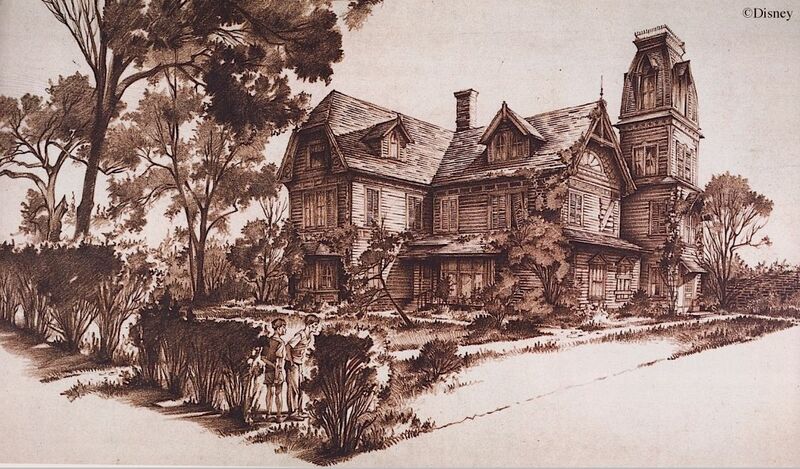 Most famously, of course, Sam McKim did a paint-over of Anderson's sketch, producing what is perhaps THE most iconic rendering of the HM of all time. The whole painting seems to swirl with movement. Yeah, I know I've posted this before, but I never tire of looking at it. I suppose McKim could take some solace in that fact that at least Ken kept his black cat weather vane. be his as well. They show the kind of setting Ken explicitly had in mind. With this 1961 sketch (actually, a "working elevation" drawing) by Marvin Davis we are getting close to the finished version, but it still retains a number of features from the Anderson version that will be altered within the coming year. For example, we still have the square Shipley-Leydecker cupola, and we still have McKim's black cat up on top, soon to be replaced with a schooner (sorry, Sam). We finally have the neat and clean look that Walt demanded, anyway. In fact, if you compare the Marvin Davis drawing to blueprints of what is actually there, you will notice quite a number of substantial differences, so in my view we are still en route from Ken's first sketch to the final building, although obviously we are getting close. 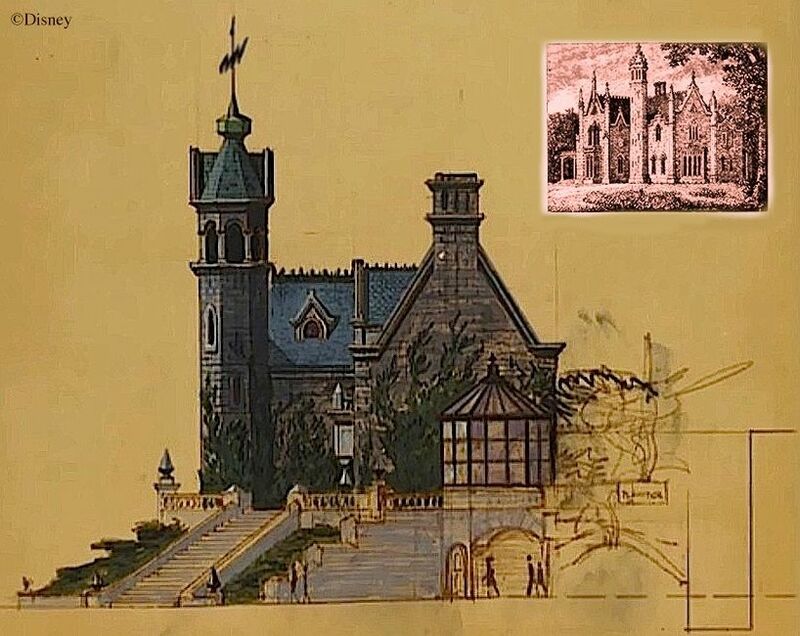 A similar story about the architectural development of the WDW Mansion could be told too, but naturally it wouldn't have the depth of history or the sheer variety of artistic concepts that the original DL version had. 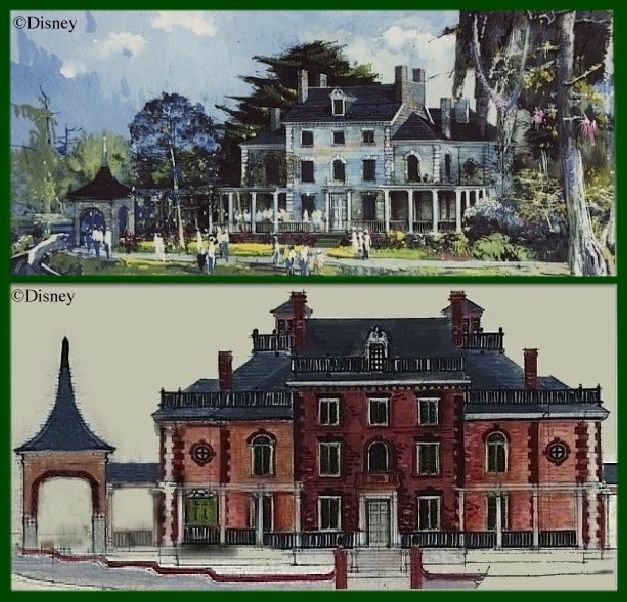 One alternate worth mentioning is Disney legend Herb Ryman's concept of the WDW HM as an ordinary looking, pre-revolutionary, New England manor house. It's handsome, yes, but . . . a little dull. Yes, there are two. 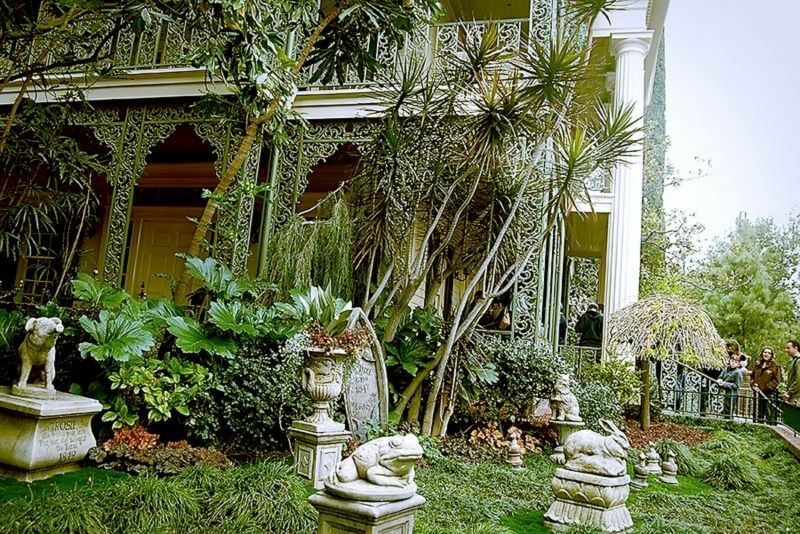 Imagineer Kim Irvine (daughter of "Madame Leota" Leota Toombs) came up with the idea for the first one in the early 1980's. Not a lot of time and effort went into the project. 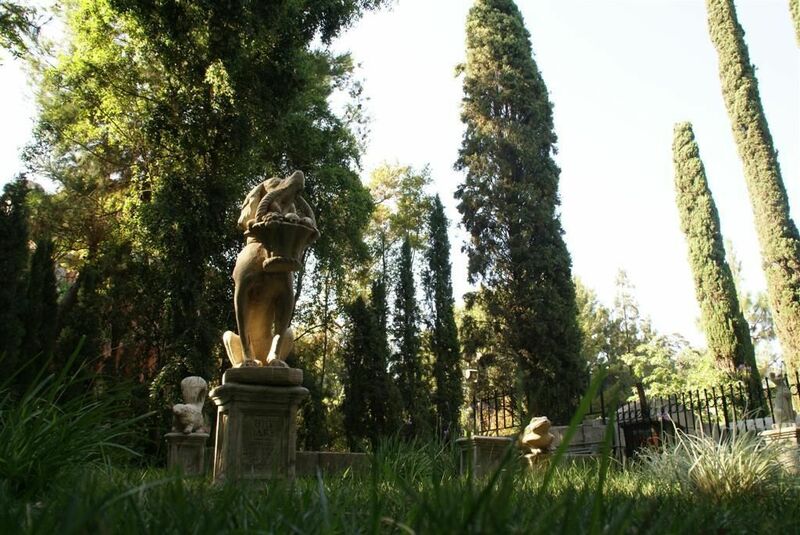 Kim just purchased off-the-shelf yard statues of a dog, cat, skunk, and frog (complete with mouth hole for squirting water) and had Imagineer Chris Goosman compose some macabre epitaphs for the pedestals. They were put in the vacant yard on the north side of the HM, alongside the wheelchair access path, reportedly to give them something to look at over there. Here lies my good dog Jake. Chasing a toad down a well was his one mistake. After losing eight lives you still had no fear. You caught a snake in your ninth and that's why you're here. You didn't drink, you didn't smoke. I just can't figure what made you croak. But your presence will always linger on. 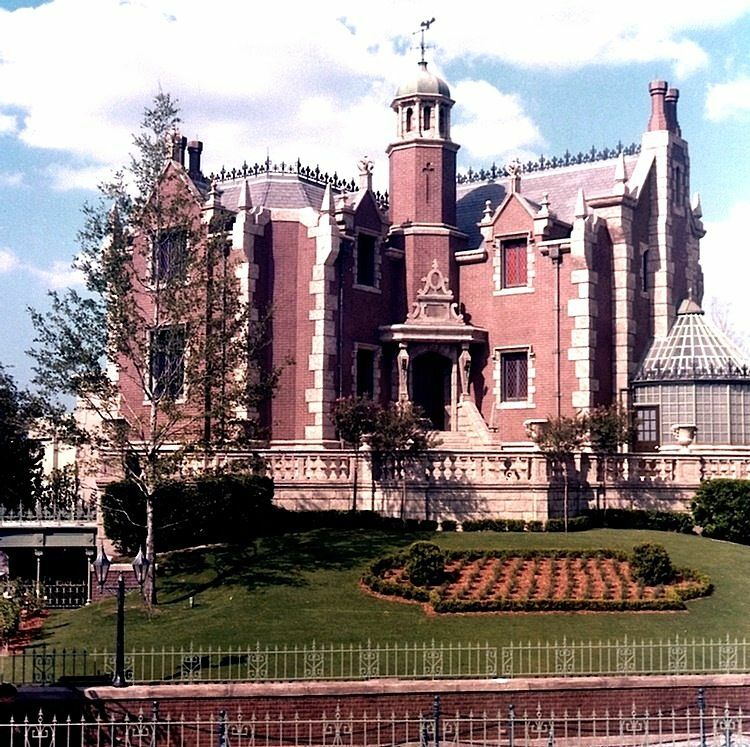 Everyone seemed to like this little HM secret, so in 1993 they put another one in the front yard. 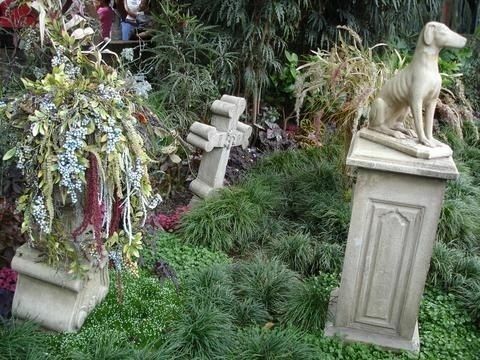 It has proven so popular that they subsequently added similar pet cemeteries to the WDW and Tokyo HMs. Those are the well-known facts, familiar to most Mansionites, if not to the general public. Beyond that basic history, no one has bothered to say much. But Long-Forgotten readers are a tough and discriminating audience. They ask, nay, demand more. Pry up those rocks and see what's crawling around underneath. More cutsie-wootsie stuff, ill-suited to the dignified exterior of the HM. And I hadn't noticed the mouse in previous photos, so I'll point to it now as part of the whole package. Anyway, bleahh. I'm only glad all of this is in a place generally unseen and easily ignored. I look forward to spending a lot of time forgetting it exists. As I said in the last post, I'm not a huge fan of the PC. I think most purists and traditionalists see it as an unwelcome intrusion of sheer fantasy before the attraction even begins and would happily see it gone. That's more or less been my position too, and yet I can't get worked up about it. Something about the pet cemetery is okay, and it's time to figure out why. Let's take a closer look. Much of the front yard version simply repeats the formula of the old one. Once again you've got a lot of store-bought statuary sitting on pedestals with macabre epitaphs. 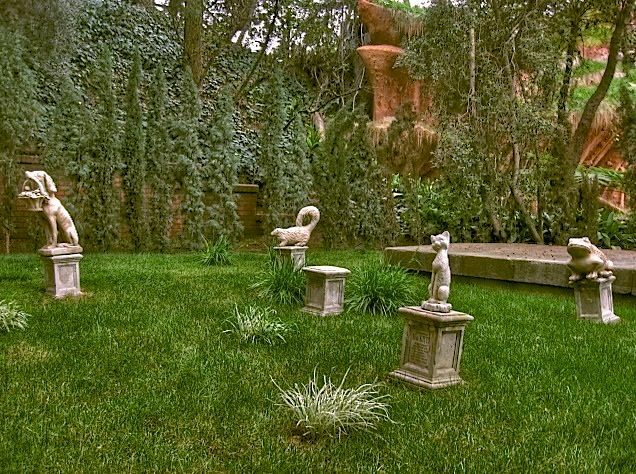 In fact, two of the statues (the frog and the skunk) are virtually identical to their back yard counterparts, although they have new names and texts. The main difference out here is that some dates are attached. The frog is "Old Flybait" ("He croaked, August 9 1869") and the skunk is "Beloved Lilac" ("Long on curiosity...Short on common scents, 1847"). There's also "Rosie" ("She was a poor little pig, but she bought the farm, 1849") and a dog named "Buddy" ("Our friend until the end"). The latter may be a long-overdue tribute to Buddy Baker, the musical genius behind the HM score. 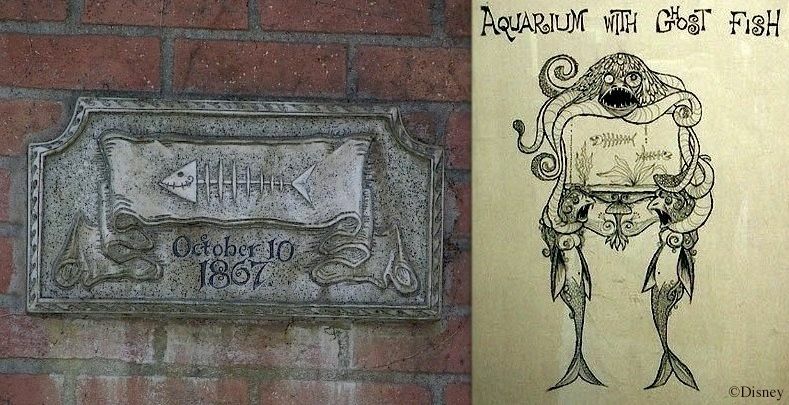 The dating formula is obvious in the case of Old Flybait; it's exactly 100 years before the HM opening day, and this suggests that the other dates are really cryptic references to 1947 and 1949, probably the birth years of the Imagineers involved. There's nothing terribly out of place in any of these examples. They are all of a piece. 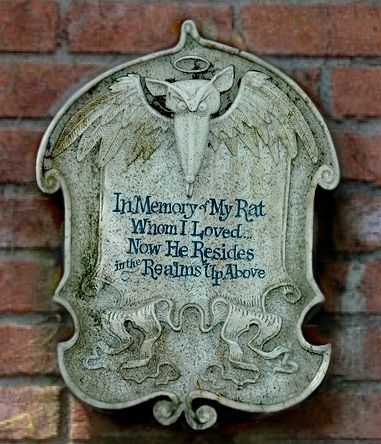 We can easily imagine one or several family members in the mansion's long history being animal lovers and burying their pets out front, complete with whimsical epitaphs. Even if the choice of animals is eccentric in some cases, there is nothing surreal involved, not even anything supernatural. In one case, however, these conventional statues are arranged in such a way as to suggest that the animals involved have business to conduct in the afterlife. There is a clever thematic continuity between this cluster and some of the relationships you encounter inside the house. Imagine the graveyard executioner, a man who in life wielded the power of death but who has now followed his victims into the grave. It's called irony. Better still, imagine the cat as Constance and the birds as her husbands, and you can feel the same chemistry at work. No one forms a partnership with Death so powerful and so lasting as to avoid the same fate as Death's other victims. It's a classic statement, made at least three times in the attraction, starting with this tableau. 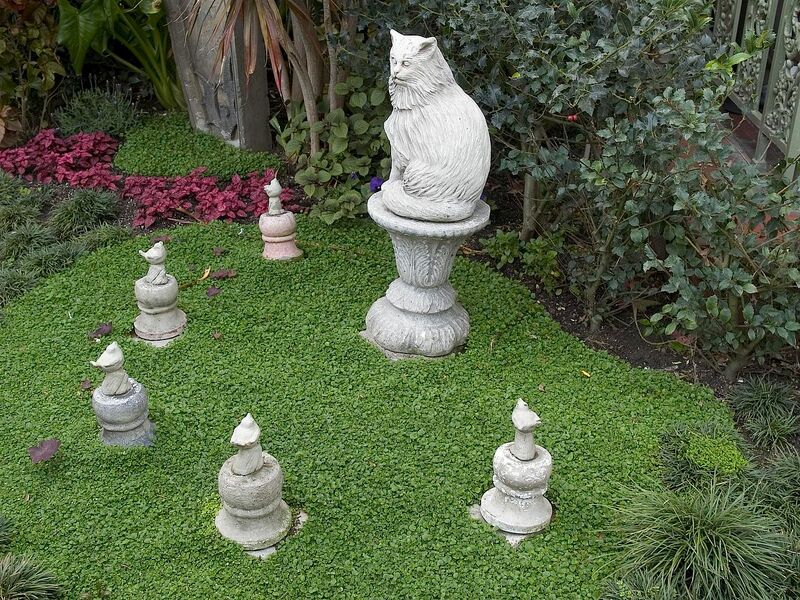 I think the cat-and-bird set is perhaps the high water mark of the pet cemeteries. There is, however, a whole other set of grave markers. 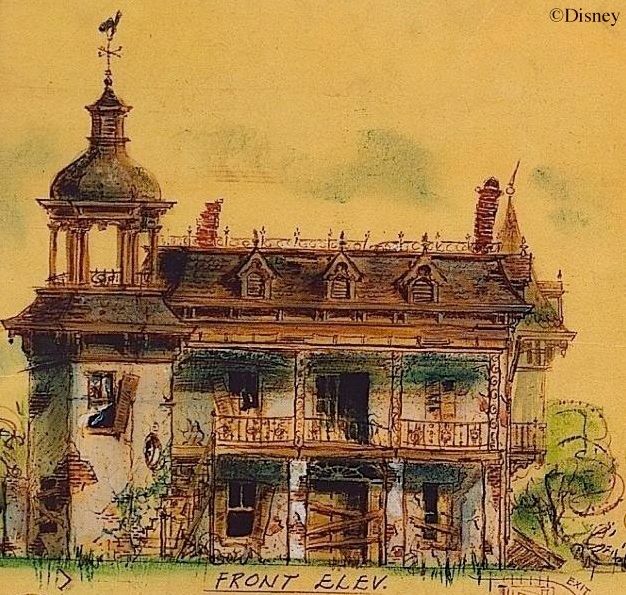 These are original WDI designs, and they have a more fantastical flavor. I suspect that it is these that rub some fans the wrong way. 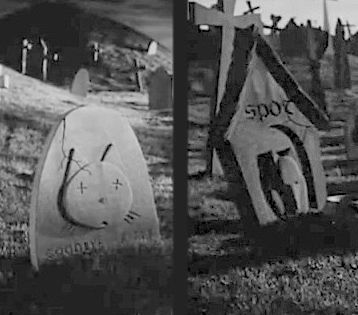 There's Fi Fi the dog, with her cruciform tombstone made of crossed bones and her portrait with crossed-X eyes (like in the funnies). This piece is significant for reasons that have nothing to do with the intentions of the designers. It represents a change in the general culture between 1969 and 1993, but that will be the topic of another post. 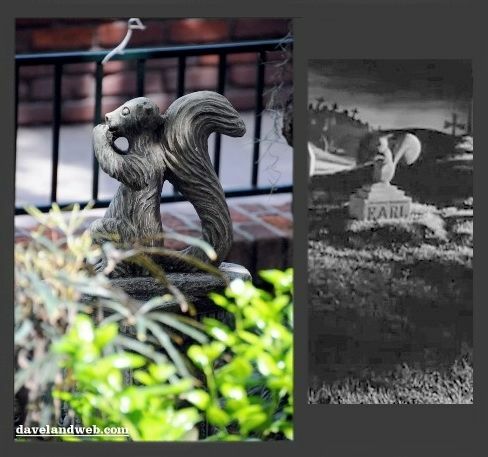 For the moment, I'll simply note that it is the only cross-shaped headstone in the entire attraction, including all of the scale models and all of Marc Davis's concept art. 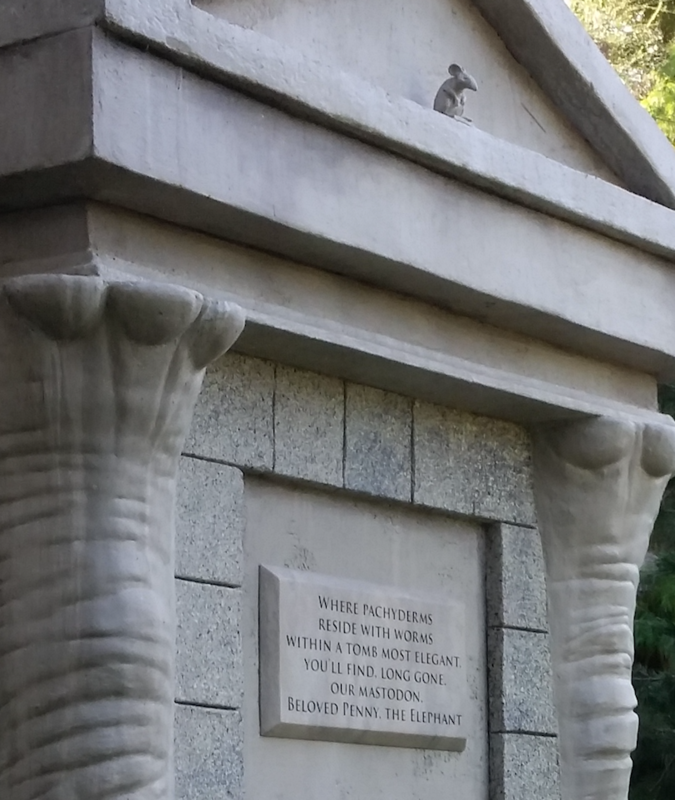 The other weird monuments are for a snake, a bat, a rat, a fish, and a spider. The pieces are nothing if not stylish. It's a good deal harder to imagine these as simply the products of animal lovers in the Mansion's history. The style of the monuments themselves is too bizarre. Perhaps we are to imagine not merely animal lovers, but insane animal lovers, if we want to keep these within the imaginative realm of a real house with a history of real occupants—which is the starting point of the HM voyage. If imagining these pet monuments as items designed by crazy family members seems a stretch, then these freaky-deaky things simply don't belong here. For me, there are enough tales of nutball Victorians to keep it all just barely within bounds. 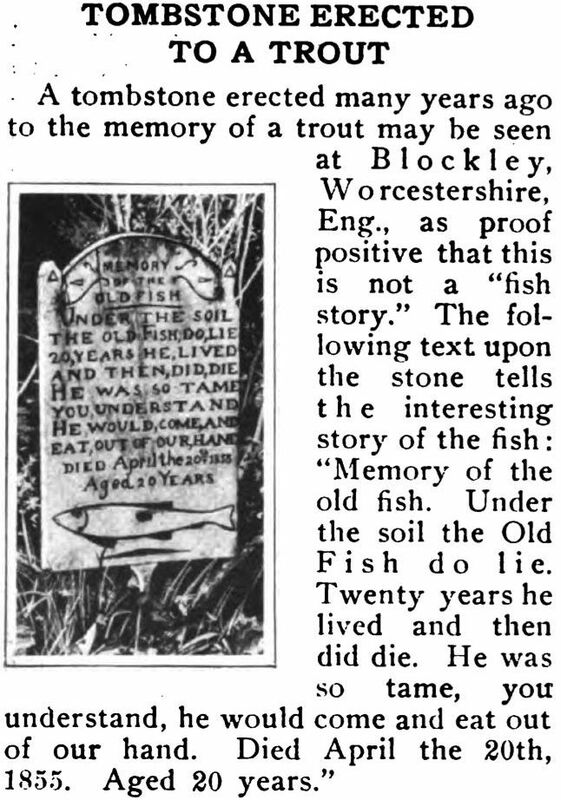 As if to illustrate exactly that point, Craig Conley sent me in November of 2016 the following clipping from a 1913 edition of Popular Mechanics, noting an 1855 grave marker for a fish. Okay, even if we are not necessarily in the realm of fantasy, you still wonder what the original Imagineers were shooting for. 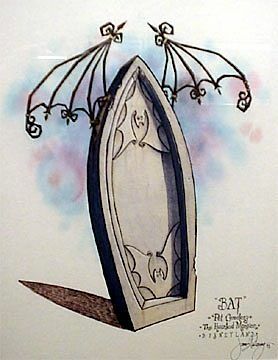 In one of the Long-Forgotten threads at Micechat, someone argued that pieces like Freddie the Bat were inspired by Tim Burton's Nightmare Before Christmas, which would eventually take over the whole Mansion every Fall and Winter, of course. If you compare concept art for Freddie with typical NBC artwork, the similar look and feel is indeed striking. But the dating is against it. NBC was released the same year the pet cemetery was installed: 1993. Better to look elsewhere for inspiration for this fantastic and surreal streak. [Edit: But see new evidence below.] As a matter of fact, the original HM Imagineers did kick around some lunatic pet ideas for the HM. 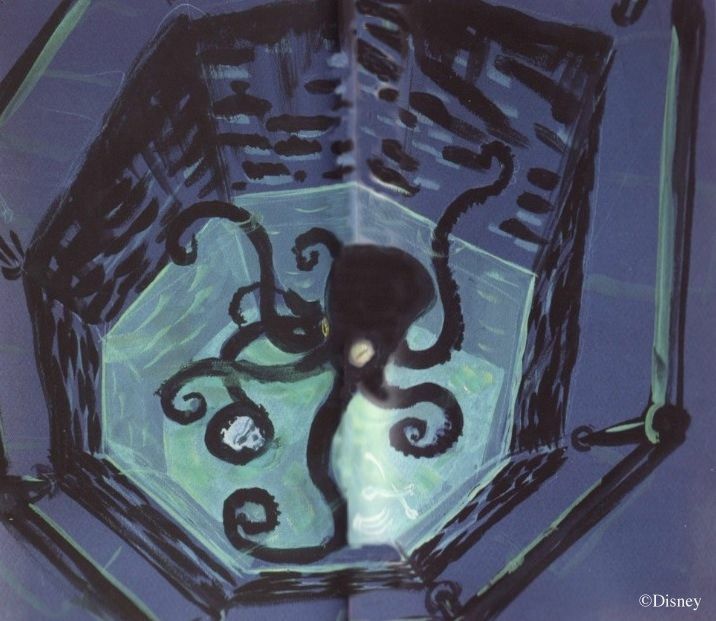 Ken Anderson toyed with having a man-eating octopus in a pit in the middle of a room in his 1957 Ghost House. Which is pretty . . . out there. 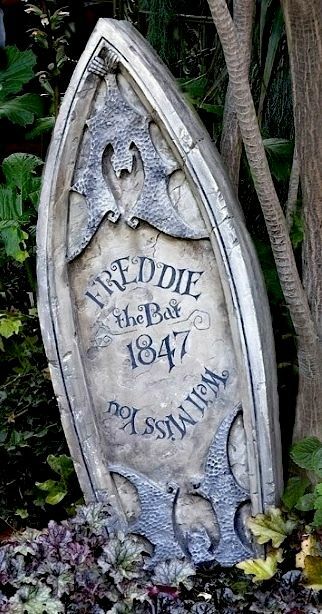 Very, very few people know this, but Rolly actually designed some bizarre tombstones for the HM. 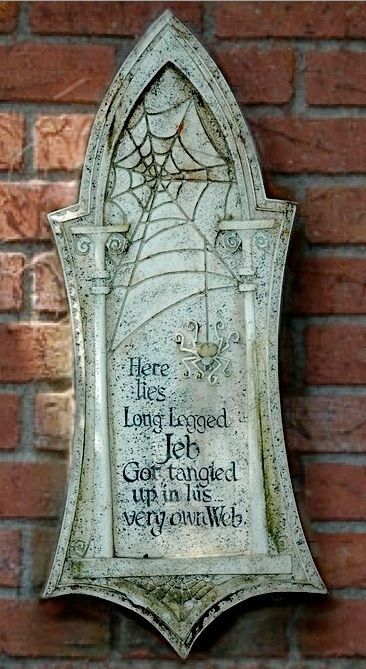 Where they would have been used, I can't imagine, but it must be admitted that Freddie the Bat has nothing on Velma Wingspan when it comes to eccentricity, and isn't the spidery lettering style used on the pet cemetery stones just a teeny weeny bit reminiscent of Rolly's "Museum" font? "But even if Ken, Marc, and Rolly kicked these kinds of ideas around, they ultimately decided NOT to go in that direction, so even if the pet cemetery Imagineers were drawing inspiration from those guys, they also overrode their judgment by going ahead with this kind of thing." Yeah, I hear that, and it's a good point, but I still take some comfort in the idea that the newer Imagineers respected and revered the original masters and sought to draw inspiration from their work. And anyway, since the pet cemetery, even at its most surreal, can be placed within the imaginative orbit of the Mansion, I've decided to call a truce on this one. One of our "Anonymous" commenters directs our attention to a short 1984 film by Tim Burton, Frankenweenie, produced by Walt Disney pictures. 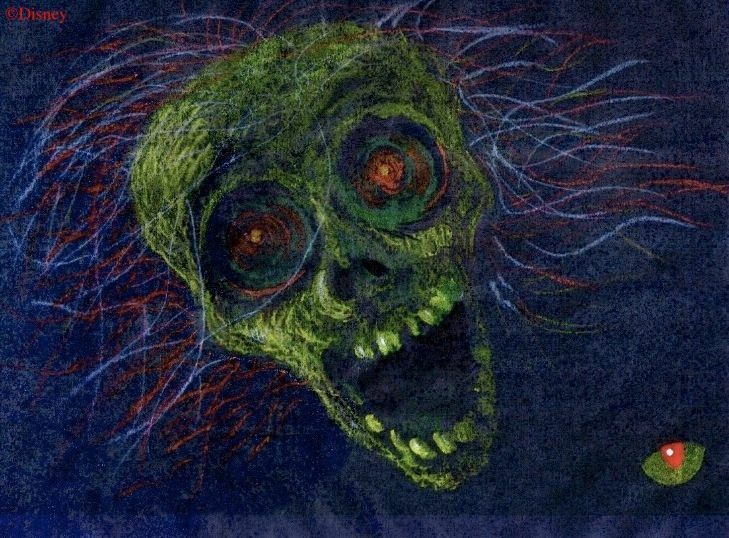 Reportedly, Disney fired Burton after making it, claiming he had wasted company resources and had produced a film too dark for Disney to use. It later had video and DVD releases. Well, SOMEONE at Disney liked the film. There can be little doubt that it was a direct influence on the front yard pet cemetery. 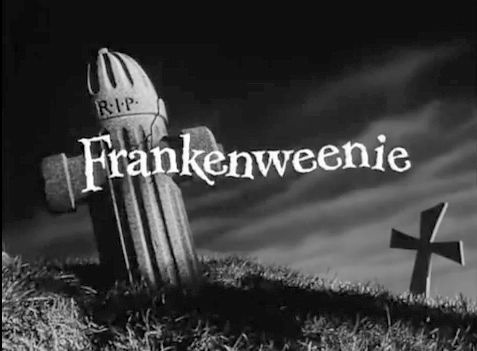 The film is a parody/homage to Frankenstein, so there are important graveyard scenes—in a pet graveyard. 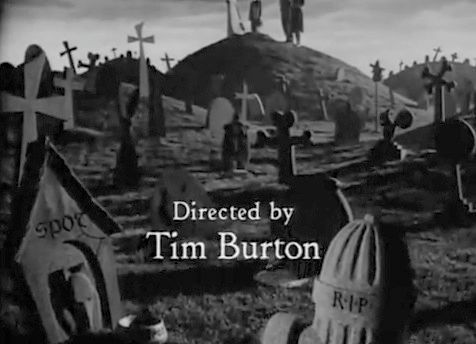 It appears also in the film's opening titles. 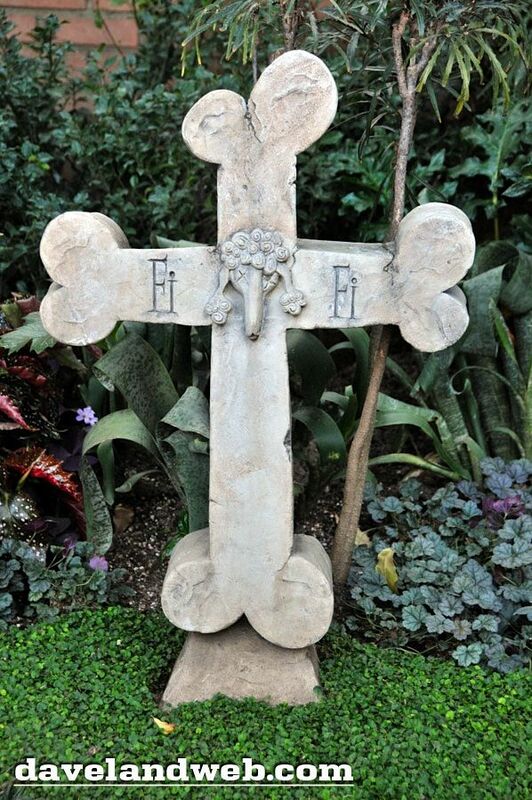 Fifi's tombstone at Disneyland is obviously taken almost directly from this movie. 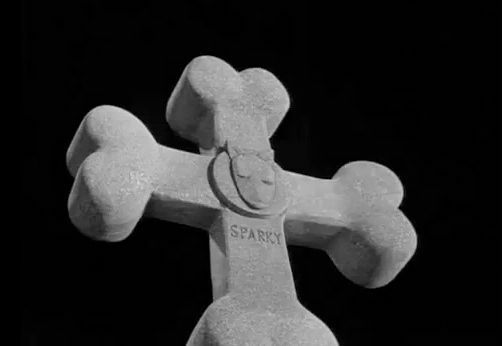 cemetery, but "Sparky" is the main animal character in the film. been inspired by various other tombstones seen in the film. There are also tombstones for a goldfish and a snake in the Burton graveyard. 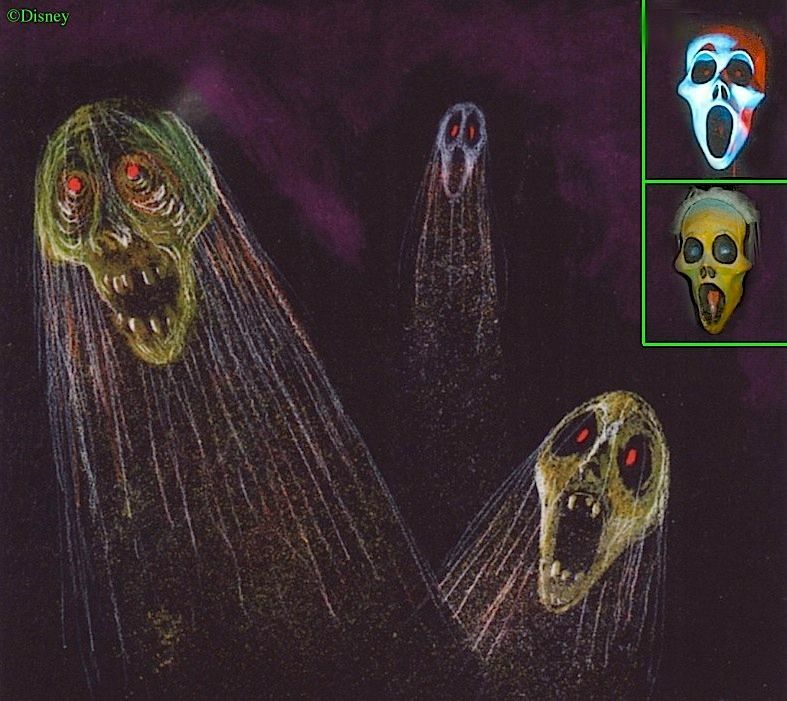 This raises the distinct possibility that Imagineers (or at least Kim Irvine) were aware of Burton's work on Nightmare while it was in production and saw some of the models, and so possibly that artwork was an additional influence on the style of the 1993 HM pet cemetery. A big thanks goes to "Anonymous" for the tip.